D. Pineo and Ware, C., “Data Visualization Optimization via a Computational Modeling of Perception”, IEEE Transactions on Visualization and Computer Graphics, vol. 18. Association for Computing Machinery (ACM), New York, NY, USA, pp. 309-320, 2012. J. Beaudoin, “Real-time Monitoring of Uncertainty due to Refraction in Multibeam Echo Sounding”, The Hydrographic Journal. Hydro International, Clevedon, Somerset, UK, pp. 3-13, 2010. 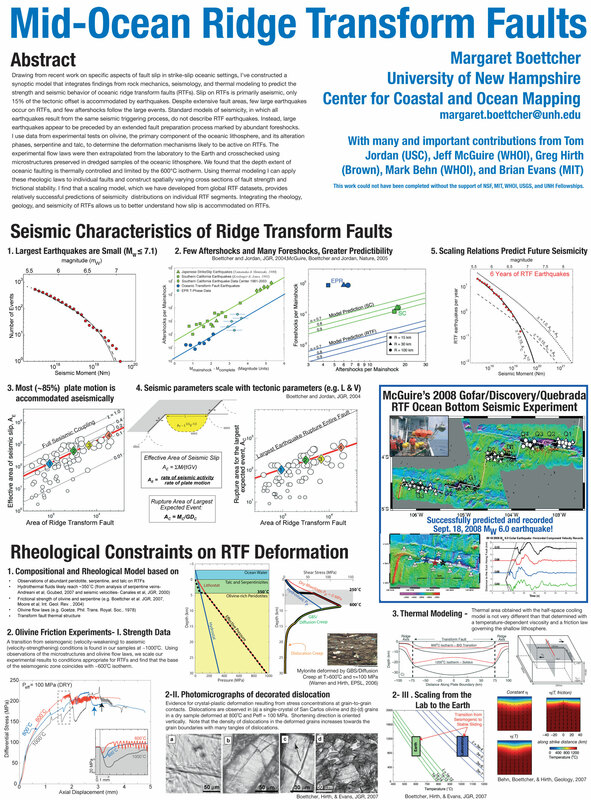 S. L. Walker, Baker, E. T., Malik, M. A., Greene, R., Buck, N., Embley, R. W., Merle, S. G., Lupton, J. E., and Resing, J., “Gorda Ridge Revisited: the R/V Okeanos Explorer Conducts its First Hydrothermal Plume Survey”, Ocean Sciences Meeting. Portland, OR, USA, 2010. J. V. Gardner, “Bathymetry of West Mariana Ridge and Eastern Parece Vela Basin: A Lot of Surprises, Subduction Factory Studies in the Izu-Bonin-Mariana Arc System”, Results and Future Plans Conference. Honolulu, HI, USA, 2007. K. Schwehr, Driscoll, N. W., and Tauxe, L., “Origin of continental margin morphology: submarine-slide or downslope current-controlled bedforms, a rock magnetic approach”, Marine Geology, vol. 240. Elsevier, New York, NY, USA, pp. 19-41, 2007. J. Glynn, de Moustier, C., and Huff, L. C., “Clearance of Harbor Navigation Channels with High-resolution Bottom Surveys”, Acoustical Society of America (ASA). Salt Lake City, UT, USA, 2007. K. Schwehr, “AIS Binary Messages, Domain Examples and a Case for a XML Message Definition Language”, USCG Puget Sound VTS. Seattle, WA, USA, pp. 1-47, 2007. R. Braswell, Jacobi, M., and Schwehr, K., “Portsmouth Harbor Response Initiative Web Interface”, Coastal Response Research Center Workshop. Durham, NH, USA, 2007. C. E. Parrish, “Imaging in Various Regions of the EM Spectrum for Mapping the National Shoreline”, GeoTech. Silver Springs, MD, USA, 2007. K. Schwehr and McGillivary, P. A., “Marine Ship Automatic Identification System (AIS) for Enhanced Coastal Security Capabilities: An Oil Spill Tracking Application”, IEEE Oceans. Vancouver, British Columbia, Canada, pp. 1-9, 2007. Y. Rzhanov and Gu, F., “Enhancement of Underwater Video Mosaics for Post-Processing”, IEEE Oceans. Vancouver, British Columbia, Canada, 2007. L. C. Huff and Fonseca, L., “A Surprise Occurrence in Acoustic Bottom Backscatter Measurements Conducted in the Eastern Bering Sea”, U.S. Hydrographic Conference (US HYDRO). Norfolk, VA, USA, pp. 0-0, 2007. M. L. Wolfson-Schwehr, Naar, D. L., Howd, P. A., Locker, S. D., Donahue, B. T., Friedrichs, C. T., Trembanis, A., Richardson, M. D., and Wever, T. F., “Multibeam Observations of Mine Burial Near Clearwater, FL, Including Comparisons to Predictions of Wave-induced Burial”, IEEE Journal of Oceanic Engineering, vol. 32. IEEE, Washington DC, Washington DC, USA, pp. 103-118, 2007. T. C. Weber, Pena, H., and Bradley, D. L., “Identifying Bubble Clustering: Comparisons of the Coherent and Incoherent Fields”, Underwater Acoustic Measurements: Technologies & Results (UAM). Heraklion, Crete, Greece, 2007. F. Pohner, Bakke, J., Nilsen, O., Kjaer, T., and Fonseca, L., “Integrating Imagery from Hull Mounted Sidescan Sonars with Multibeam Bathymetry”, U.S. Hydrographic Conference (US HYDRO). Norfolk, VA, USA, pp. 0-0, 2007. J. Glynn, “Acoustic Calibration and Bathymetric Processing with an L-3 Klein 5410 Sidescan Sonar”, 2007. 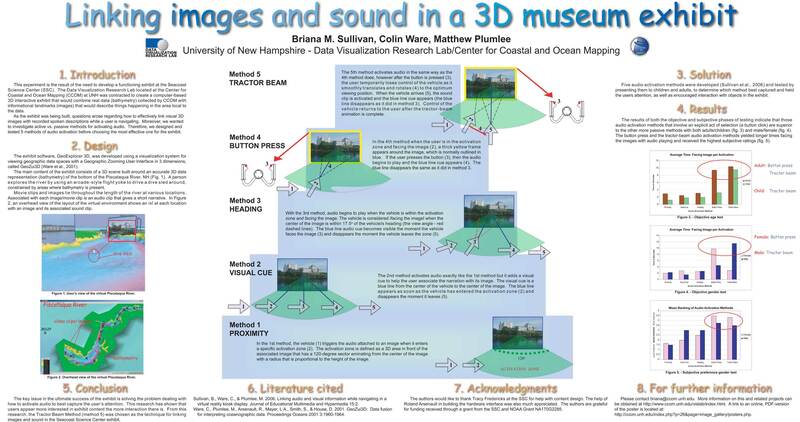 B. M. Sullivan, Ware, C., and Plumlee, M. D., “Linking Images and Sound in a 3D Museum Exhibit Demonstration”, World Conference on Educational Multimedia, Hypermedia & Telecommunications (ED-MEDIA). St. Andrews, New Brunswick, Canada, pp. 0-0, 2007. J. V. Gardner, “UNCLOS Mapping of Marianas Western Margin, Technical Report”, University of New Hampshire (UNH), Center for Coastal and Ocean Mapping (CCOM)/Joint Hydrographic Center (JHC), 2006. L. C. Huff, “Long Range Side Scan Sonar for Fishery Research”, Oceanology International (OI). London, London, UK, 2006.